Whenever you plan to buy an instrument especially if you are a beginner in the field of music, you should understand that playability in the beginning years would be limited and thus you don’t need an instrument with all the advanced features. Buying a full featured instrument often becomes frustrating and beginner may even be discouraged at learning to play that instrument. Not only that but as you buy any such instrument, you are actually paying a lot of extra money that is not needed to be spent in the beginning. These are some basic considerations when the instrument of your interest is an expensive one such as a piano. For understanding of basics and concepts of music over piano can be easily done with a best piano keyboard for beginners. When we talk about keyboards, you will be able to find a wide range of products that have functions and features to suit your level, interest as well as budget. Why Beginners should own a Keyboard? How to Play the Keyboard? As you make your decision to prefer buying a keyboard over piano, you still get different choices in the form of different types of keyboard available. Depending on the type you purchase, you will be able to experience varied sound effects. Here we are briefly describing 4 types explaining intention and capability of each type of keyboard. Basic sequencing function and a lot more. Many of the synthesizers do have preset sounds so if you would just want to plug-in keyboard and begin playing; make sure you check presets. For those who would like to work on their own creations, a larger set of memory locations may be more appealing. There are other features to look for such as weighted keys, larger polyphony, controls, built-in effects, filter function etc. that you should consider before purchasing a synthesizer. CD burner and other built-in features. When a composer or a producer choses a keyboard workstation, he should make sure that it has enough polyphony, sequencing and recording ability as he would need it to handle during a production process. Arranger keyboards are portable equipment that proves helpful in the process of songwriting. It includes a number of different tools along with high quality sound engines that gives you a complete band. You can work on different creative and unique ideas for a complete song with sounds and sequencing tools of these keyboards. These types of keyboards cannot match the versatility and broadness of a workstation but are a superb choice for solo performers and live performances. You can find all the main instrument sounds in an arranger and it gives you the freedom of customizing and carrying your own brand style. The main advantage with an arranger is that you can have your chord progression plugged in according to your own style and later can add other type of music feel to follow your progression. 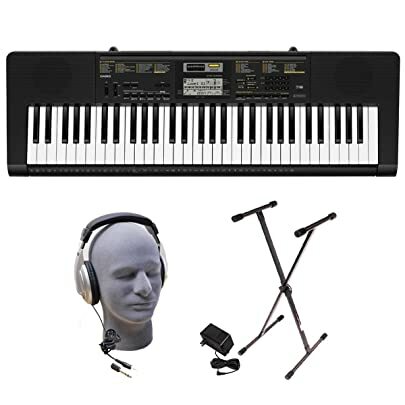 Most suitable choice of keyboard for beginners with no or little knowledge of this instrument, the portable keyboards are most basic form of a keyboard that includes learning features to guide and help beginners learn this instrument with ease. Most of the portable keyboards include USB connectivity so students can learn various songs by downloading from computer. They can transfer their files from and to a computer device and record their practices well. For a beginner, a portable keyboard is a fun and entertaining way of learning to play instrument/s. Keys: A standard keyboard can have varied number of keys ranging from 25 to 88. Considering keyboard keys when making a buying decision would completely depend upon the type of music you will play along with space that you have for keeping a keyboard. Some common keyboard key options include 61 keys, 76 keys and 88 keys. Keyboard Action: Next thing that is important is the keyboard action. Each of the different types of keyboard gives you varied feel and action. You can find full weighted, semi-weighted, hammer action and synth If you wish to have a feel of a real acoustic piano, you can opt for a full, semi-weighted or hammer action keyboard that would make you feel like playing on a grand piano. Whereas for fast lead passages players, a keyboard with synth action would be more suitable. A synth action keyboard is more like an organ with no resistance. Keyboard Sensitivity: Adding to the feel of playing on a keyboard and making it appear more like a grand piano feel is accredited to the sensitivity of keys. Keyboard keys may be touch or speed sensitive and as you press keys a sound is created according to the force or speed of pressing. Maximum Polyphony: A keyboard is capable of producing many sounds at a time. Larger the maximum polyphony, better it would be for an enriched and versatile orchestral performance. Connectivity: A keyboard that features MIDI/USB or other computer connectivity options should definitely be preferred over the one that doesn’t have this feature. Having connectivity would enable you to connect your instrument with other devices to create more opportunities for learning and playing over keyboard. You would be able to connect your keyboard to other instruments and interfaces. Arpeggiator: A chord with notes played successively is an arpeggio. A keyboard with arpeggiator would create an arpeggio electronically with only a single note played. Sequencer: Sequencing hardware or software in a keyboard enables you to record performance data and user can program play back of that sequence. Controlling Options: A keyboard can offer complete control to user in the form of control over pitch, volume and other options. Such keyboards include modulation wheels, knobs, sliders and other control options. Sampler: Digital audio recording device that enables user to record, alter and playback audio in varied ways. You can even include additional clips of audio to your recorded music and can play back in a different manner. Keyboards are designed to give you look and feel of a piano but there is much more to it. Here are some reasons why beginners should opt for a best piano keyboard. Keyboards give you a great variety of sounds that you can use for varied practice and learning sessions. Thus gives you chance to be creative with your performance and learn versatility. Keyboard encourages accurate playing. When you make a mistake on a piano it often goes unnoticed however a mistake on a keyboard is easily identified. You can play with backing tracks on a keyboard thus adding to your ability to play in time with exact precision. It gives you added opportunity to mix various sounds for practice and creation with MIDI connectivity. Beginners may not be willing or may not have budget to buy an expensive piano. A good quality keyboard cost can range between 200 to 1000 USD and that too depends upon how rich you want your keyboard to be with advance features. Thus a keyboard can be a good chance for a beginner to explore playing piano and to check if he really finds it interesting. Keyboards include headphone jacks that makes practicing easier. It is a good choice for beginners who wish to take lessons and practice at any point of time during day or night without disturbing others in the household. Keyboards are portable and thus if you plan to go for lessons or take your keyboard anywhere for practice; it would not be a problem. Maintaining a piano can be hassle for a beginner with no knowledge of tuning and maintenance. Keyboards are much easier to upkeep and they would not need any tuning at all. With all these benefits, one major consideration that a beginner should keep in mind is to get a keyboard with weighted keys. This is important especially if you wish to learn and play professionally. You should opt for a good quality keyboard with full 88 weighted keys with some level of resistance. Learning on a good quality keyboard will enable you to learn all the dynamics of piano and later transition to a real grand piano would be much simpler. A complete set of 88 piano keys are built-in with the Yamaha YPG-535 with Graded Soft Touch technology that makes this piano responsive to the force of touch. It comes with a power adaptor, sustain medal and a stand that makes it a complete package for piano players. Beginners as well as intermediate piano learners would love the Yamaha Education Suite features that offers interactive learning programs. A built-in 6 track recorder makes it easier for pianists to create their compositions and store them. Apart from that USB to device connectivity enables you to transfer more of data from and to this piano keyboard. The high resolution stereo sampling gives expert players a perfect pitch and tone to add beauty and versatility to their performance. All of that and a lot more is offered at a price tag that is affordable in comparison to other expensive models. You wouldn’t need any musical sheet, thanks to the clear LCD display of this instrument that makes writing, recording and playback simple. All in all it is a portable and easy to use best piano keyboard with best sound and options. High quality construction and sound sampling. Portable keyboard perfect choice for travelling musicians. Built-in music and database of sounds. Full 88 keys touch sensitive keyboard. Yamaha Education Suite and other ease of learning options for beginners. Keys are not weighted however it is a full keyboard with touch sensitivity to intimate real piano playing. Limited 32 polyphony whereas some other models in the same price range offers higher polyphony too. Auto power off feature is missing. This piano keyboard has 76 keys that are built with Graded Soft Touch action keys to give you authentic feel of a grand piano. Though there are traditional models having 88 keys and when you are really concerned about using each key, it may make a difference. It is one of the best portable keyboards that is also budget-friendly. A wide range of special sounds and a number of songs makes this piece and interesting one for those who wish to practice varied ranges. Apart from that it offers computer connectivity that is a major plus for both practicing beginners as well as professionals. Belonging to a brand that is well-known as per piano keyboard reviews for high quality and performance, Yamaha YPG-235 can be an excellent choice with built-in sequencer (6-tracks), headphones, power adaptor, clear display LCD and much more. An interesting aspect of this piano for beginners is the presence of Yamaha Education Suite that offers an interactive learning platform to master various songs. Demo songs, split action and varied levels of difficulty makes it an ideal choice for learners. High quality and durability of Yamaha Brand. Price is affordable and thus most popular among beginners and learners. Wide range of voices and demo songs for practicing. Yamaha Education Suite for interactive learning. LCD display with system easy to use. Keys are not weighted limiting advance level players to enjoy realistic feel that is available with some advance models. Limited 32 polyphony so if many keys are pressed, tones produced would be inconsistent. Auto power shut off feature is missing. For beginners and all those who wish to learn to play piano but have the lowest budget, this piano will suit well. This piano is a 61 key and 48 polyphony keyboard. 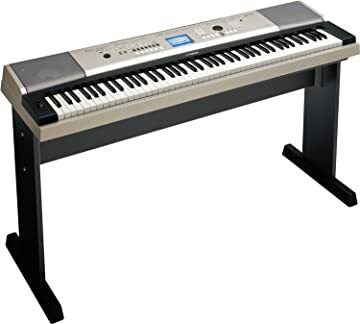 Though the number of keys is less than many other digital pianos but if you are looking for something with a low budget, digital piano reviews suggest that it would be a right choice. This Casio piano features built-in microphone that is relatively new and innovative method of sampling. 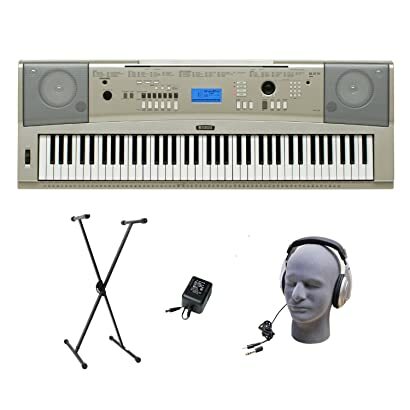 With the purchase of this piano, you will get some other accessories including X-style stand (fold-down feature for portability), power supply and Samson HP30 closed-cup headphones. Apart from that it has 400 instrumental keyboard voices, 110 songs, multiple rhythms and effects. The samples can be used in the rhythm with its Voice Percussion function. Sampling and sound effects are improved to give musicians an excellent experience of playing this keyboard. Simple to use features and functions. Range of keyboard voices, effects, rhythms and songs. 48 polyphony enables you to play advance chords. It doesn’t include a sequencer. It may not be a suitable choice for expert pianists due to lack of features but is a superb choice for beginners and learners. Step 1: Know your Instrument: No matter what type or model of keyboard you will be playing, the first step that prepares you to play the instrument well is to know your instrument well. Once you know all ins and outs of your keyboard, rest will be much simpler. Step 2: Knowledge of Terminologies: Different instruments include use of varied terminologies for certain aspects. Before playing a keyboard, you should make yourself aware of all those terminologies. Step 3: Get a Suitable Bench: For playing a keyboard, you will need a bench. Many of the high-end keyboards include bench as an additional accessory but if you don’t get a bench, you would need to buy one. A suitable bench is important in order for you to maintain a proper body posture over keyboard. It would be best to get an adjustable bench so it could be used by different people with adjustment and you can also adjust according to your own comfort. Step 4: Position yourself on the Keyboard: Now settle down on the bench with your feet placed flat on floor and back straight. Have your hands and fingers placed properly over the keyboard. Make sure that you don’t have to lean too much. It is important that your body should be straight but in a completely relaxed state when playing the keyboard. If you overstress your body, it could result in severe pain and injuries. Step 5: Now Begin to Play: When you are all comfortable with a correct body positioning and posture, you know what is what and where it is? Now you can begin playing the keyboard. Have a look at the keyboard and begin playing in your own way. Layout of all the keyboards is usually quite similar, the only different lies in the number of keys each have. Know Chords: A chord is a combination of three or more notes. When chords are more complex they include more notes. Each of the major chord would include a first root note that is often also termed as tonic. This note would be the base of chord. The chord is named after this root note. It is the lowest note of the chord. You can play this note using your right hand thumb or your left hand pinkie finger. Next note of your major chord would be major third, third note hit as you play a scale in key. This note gives chord its character. It is usually either half-steps or four semitones above root note of the chord. You can use your middle finger to play the major third whether you are using your right hand or left hand. Next is the top note of major chord, fifth note hit as you play a scale. This note makes your chord complete. It is seven semi-tones above root note of the chord. You can use your right hand pinkie finger or left hand thumb to play this note. When playing a major chord, it is important to review your hand and finger positioning. An effective positioning can be attained with proper practicing of chords. Make sure you maintain a natural curve of fingers over keyboard. Fingers should be standing tall over keys with slight curve. Press keyboard keys with your tips of your fingers. Learning to play a keyboard would give you a strong foundation for learning to play other instruments. The need is to analyze what features are most essential according to your need, skill and purpose of getting a keyboard and make an ideal buying decision. Consider all the aspects and some best and affordable models that we have offered here and you will end up finding a best piano keyboard for you.